The new and ongoing spate of work stoppages by teachers unions has been as much about discontent with Obama-era school reform, particularly the expansion of high-performing charter schools, as it has been about bread-and-butter economic issues. Just last week, a strike by teachers in West Virginia caused the House of Delegates to immediately table a bill that would have allowed for the creation of seven charter schools as well as $1,000 education savings accounts to support private school tuition. Teachers in Los Angeles also demanded a stop to charter school expansion during their recent strike. Union activism against charter schools is misguided given their popularity with many black and Hispanic families in urban areas where high-quality educational opportunities are sometimes scarce. Good district and charter schools can and should co-exist, and success in both sectors should be celebrated. In New York, state law already limits the number of charter schools: New York City, home to 236 charters, has only seven slots left and will reach that cap later this year. Without action by the state legislature to raise or eliminate the cap, no new charter schools will be allowed in the city. If Albany fails to act, the evidence suggests that minority and low-income families will be the ones to lose out. My recent Manhattan Institute report, “Lift the Cap: Why New York City Needs More Charter Schools,” presents data from the annual New York State tests and summarizes existing research to refute the most common charges levied against charter schools. In short, New York City’s charter schools are doing a wonderful job educating minority students from impoverished families: over 91 percent of the charter school students in the city are black or Hispanic, and 80 percent are from low-income families. These families are choosing charter schools because they offer strong academics and the prospect of upward mobility — benefits that should be available to other families too, not hindered by an arbitrary cap. On the 2018 New York State exams, the percentage of New York City charter students who scored proficient or better exceeded the average for all other public schools in the state by 12.8 percentage points in English Language Arts and by 15.8 percentage points in math. Black and Hispanic students, in particular, benefit enormously from the city’s robust charter sector. In math, the proficiency rate for black students in New York City charters is 34.1 percentage points higher than that of black students in all other public schools in the state; in English, black charter students enjoy a 26.4-point advantage. Meanwhile, Hispanic students in New York City charters outperformed Hispanic students in all other public schools in the state by 26.8 percentage points in math and by 20.7 points in English. 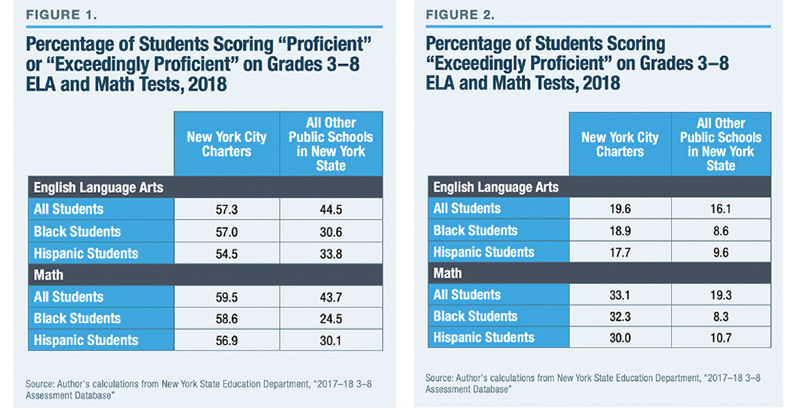 A similar pattern exists when comparing students who scored “extremely proficient.” New York City charters averaged a higher percentage of students who were extremely proficient, in both English and math, than did other public schools in the state. Black charter students in the city, for example, were about four times as likely (32.3 percent vs. 8.3 percent) to be extremely proficient in math as were black students at other public schools in the state. Indeed, more than 40 percent of all black students deemed to be extremely proficient in the state attended a New York City charter school in 2018. Teachers unions and other opponents of charter schools attempt to explain away these results with a series of assertions — none of which hold water in New York City. The success of charter schools in the city has not come at the expense of traditional public schools. In fact, city schools have steadily improved and closed the gap with schools in the rest of the state at the same time as the city’s charter schools have been growing and succeeding. Nor are the charters robbing the traditional public schools of resources. Since 2007, charter enrollment in the city has grown by 107,000 students. At the same time, the amount in the Department of Education’s budget for operating its own schools (after removing the amount that goes to charters) has grown by $7.5 billion. Charters receive less public funding per pupil than do traditional public schools in the city. They may have long waiting lists for admission every year, but New York City’s charters are not starving district schools of students. Growth in the number of charter students in the city is not matched by a similar decline in traditional public school enrollment. In fact, the enrollment decline in the city’s Catholic schools has been greater than that in the public schools in these years. Parents understand what many politicians refuse to acknowledge — that the city’s students deserve a choice, and for some of them, the best choice is a charter school. Despite the claims of teachers unions and their allies, this choice does not come at the expense of traditional public schools. Indeed, as the city’s charter sector has expanded, district schools have improved, relative to the rest of the state. District funding, too, has grown. The cap on charter schools threatens families’ abilities to choose the best schools for their children’s needs. We can only hope that New York State’s legislators will join the many public school parents who understand and value the contributions made by all types of schools — district and charters included — and lift the cap on their ability to flourish alongside one another.